As with Iraq and Libya, these laptop bombardiers offer no clear plan for how to actually end the suffering of the Syrian people. The devastating photo of 5-year-old Omran Daqneesh sitting in an ambulance after his home was bombed in Syrian or Russian air strikes has amped up calls for direct US military intervention against the Syrian government. 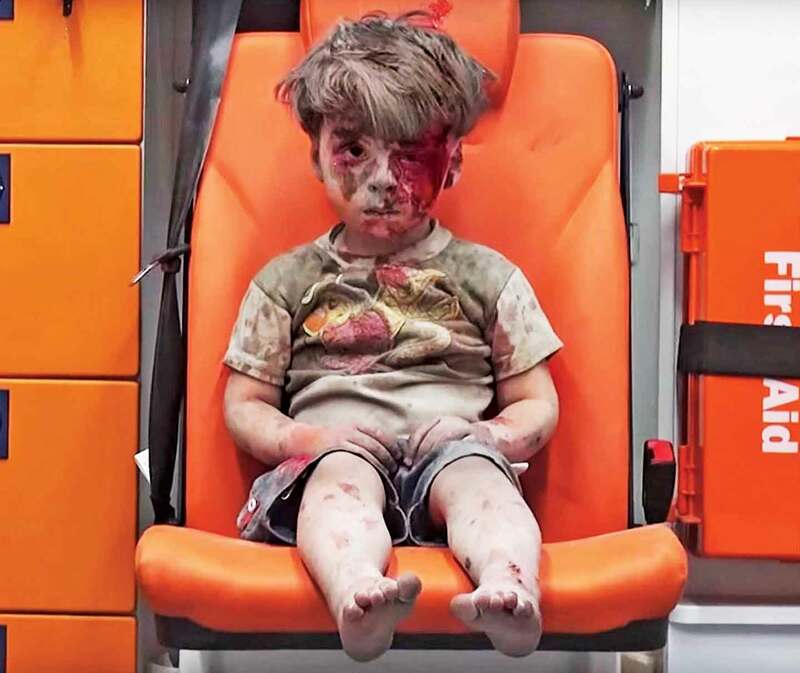 The now-viral photo of Omran—and the broader siege of east Aleppo—was prominently featured in most major newspapers, including The New York Times, The Wall Street Journal, The Guardian, and several other publications. CNN, MSNBC, and Fox News all ran stories on the photo, and editorial boards and pundits weighed in as well, with several insisting that President Obama must “do something” to stop the suffering of the Syrian people. So what do these outraged observers want “us” to do to ameliorate Syrian suffering? For prominent pundits and leading editorial boards, the answer is usually bombing the Syrian government. More often than not, they use humanitarian euphemisms like “safe zones” or “no-fly zones.” Rarely mentioned is the fact that establishing these zones would require US bombing of Syria’s air capacity, including infrastructure, planes, buildings, possibly troops. That would, in effect, be a declaration of war. How Russia would respond is anyone’s guess, but it would certainly heighten tensions between Washington and Syria’s longtime ally (which also happens to have the world’s largest nuclear arsenal). One 2012 Pentagon estimate found that enforcing a no-fly zone would involve at least “70,000 American servicemen”; another estimate insisted such an effort would involve “hundreds of aircraft, ships, submarines and other enablers.” These messy details are hardly ever mentioned when the do-something crowd calls for “action” in Syria. The pundits also omit the rather glaring fact that the United States and its allies have done quite a bit already. Those pushing for bombing repeatedly assert that Washington sat “idly by”; while they sometimes concede that the Libya intervention was bad, they still insist that “doing nothing” in Syria has been far worse. The overall assumption is that US-led airstrikes against Bashar al-Assad’s government would have been preferable to the long-drawn-out conflict that has taken place. But this would only be fair if the conflict weren’t partly funded and armed by the United States and its allies in the first place. The United States, Britain, Saudi Arabia, Qatar, and Turkey have actively armed, funded, and fueled the opposition for years. One Washington Post report puts the total CIA spending on anti-Assad forces at $1 billion a year—or one in every 15 dollars of the CIA’s official budget. This inconvenient fact is tossed into the memory hole in favor of a simplistic fable of Rwanda-like indifference. Even if they could make the case that Obama has, in some rhetorical sense, “done nothing” by not doing enough, the pundit hawks still have their work cut out for them. The pro-intervention pundits now widely accept that Washington neglected to plan for the aftermath in Iraq and Libya (President Obama even called the latter case his “worst mistake”). Yet almost no one calling for a ramped-up war in Syria has offered a clear indication of what it would entail. What are the risks? What is the endgame? Is there a realistic alternative to jihadi extremists seizing power, or—perhaps even worse—continued brutal warfare between rival militias after Assad is gone? We should be wary of pundits who use the horrors of Aleppo to rush Washington into bombing, just as they did with Iraq’s alleged WMDs and Gadhafi’s hypothetical massacres. This is part of the broader problem of moral ADD afflicting our pundit class—jumping from one outrage in urgent need of US bombs to the next, without much follow-through. Kristof, for example, was just as passionate about NATO intervention in Libya in 2011, writing several op-eds that called for bombing in equally moralistic terms. Yet as Libya descended into chaos, the country faded into the background for him. His last post on the subject? September 2011. The plight of Libyans was urgent for the Times columnist when it involved selling war to weary liberals, but once the smoke cleared, his bleeding heart dried up and he moved on to the next cause. Will Kristof and other pundits do the same with the Syrian people in the event that Assad’s government collapses after sustained US bombing? Given their track record and the lack of serious discussion about what “doing something” entails, this is the most important question—and one that few are bothering to address.